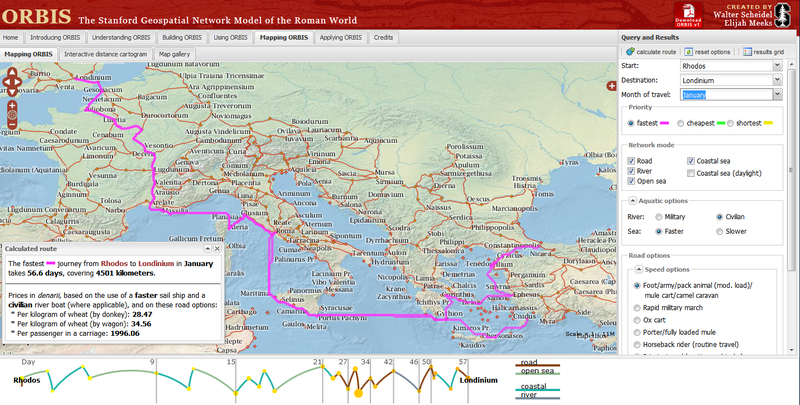 ORBIS, can calculate journey times between 751 locations in the Roman world. The site draws data from The Barrington Atlas of the Greek and Roman World which has been georeferenced by Cambridge University Students. To calculate voyages on water, the site uses maps of rivers. 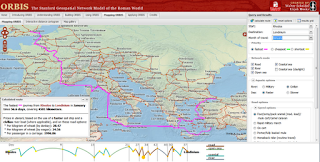 Sea journeys are also possible, with routes calculated from the Romans' preferred sea routes. Dijkstra's pathfinding algorithm is applied to calculate routes. The Mapping tool also calculates route dependent on the month for a journey, as weather conditions at sea and on land had a major impact on ancient travel times. Building ORBIS: Multi-modal network model via the Building ORBIS tab and selecting the Geospatial Technology Tab.